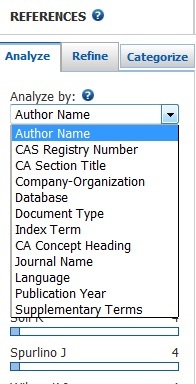 Q: How can I find information about an author in SciFinder? Log in to SciFinder. Click here for help finding a database. If you have never used SciFinder before, click "SciFinder (New User Registration)" to create an account. If you already have a SciFinder account, click "SciFinder (Registered Users)." Under "References" on the left side of the screen, click "Author Name." Enter the author's name, then click search. The more information you provide, the more specific your results will be. Check "Look for alternate spellings of the last name" if you aren't sure about the spelling of the name. The next screen will give you a list of all the names that match your search. Choose the name(s) you want to research. Scroll to the bottom of the page and click "Get References." You may want to view the full text of the articles to find more information about the author. You can use the "Analyze" tab on the left side of the screen to get more information about the references in your list. Use the "Analyze by" drop-down menu to choose the way you want to analyze your results. For example, you can choose "Company-Organization" to find the companies associated with the references in your list. You can use the "Refine" tab on the left side of the screen to narrow down your results. Use the buttons to choose the criteria you want to use to refine your results. More options or fields will appear based on the button you choose. **You may want to view the full text of articles because they may include more details about the author.